Incredibly, it’s been exactly 4 years to the day since I’ve written a destination review; but November brought with it a beautiful new adventure, and I’d like to share it now. Because sometimes a garden is still beautiful, even when most of it is dead. 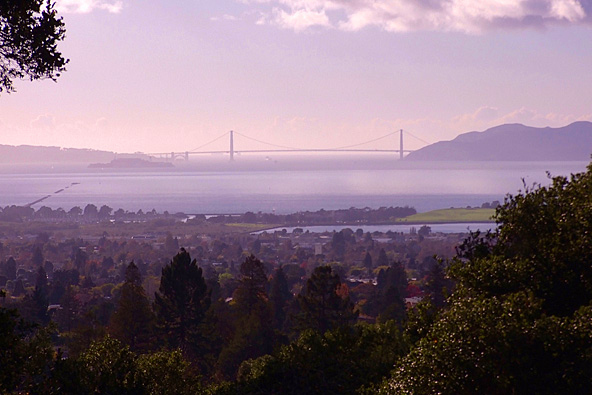 Without getting into too many details about my recent move and a somewhat uncertain future, I’ll cut to the chase: last week I took a break from writing my 4th book and found myself in Berkeley, California. I had a free afternoon, so I did some research on what to see. After weighing all the options, I decided to hike to the Berkeley Rose Garden which was an easy hike from downtown. Turns out, the rose garden is on top of a hill, and it ended up taking me about a half hour to reach it. And when I finally did, the majority of the rose plots were quite dead. So dead, in fact, that I didn’t even bother photographing them. Perhaps if I’d felt morbid, I would have, but I wasn’t, so I didn’t. Still, there were some verdant paths along the side, and I took one up and around until I reached some roses yet living. This variety is called Tahitian Sunset, and it was easily my favorite. 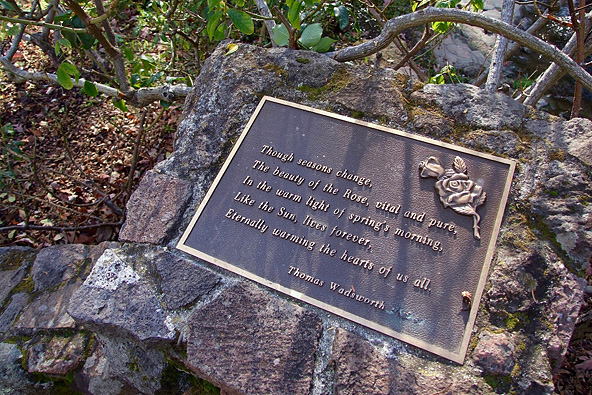 Further down, I came to a plaque with a quote by Thomas Wadsworth, who was apparently a poet and a BIG fan of roses. The entire garden is built on a slope and as I reached the lower part of the garden to the rear, I noticed a small bridge crossing the stream. 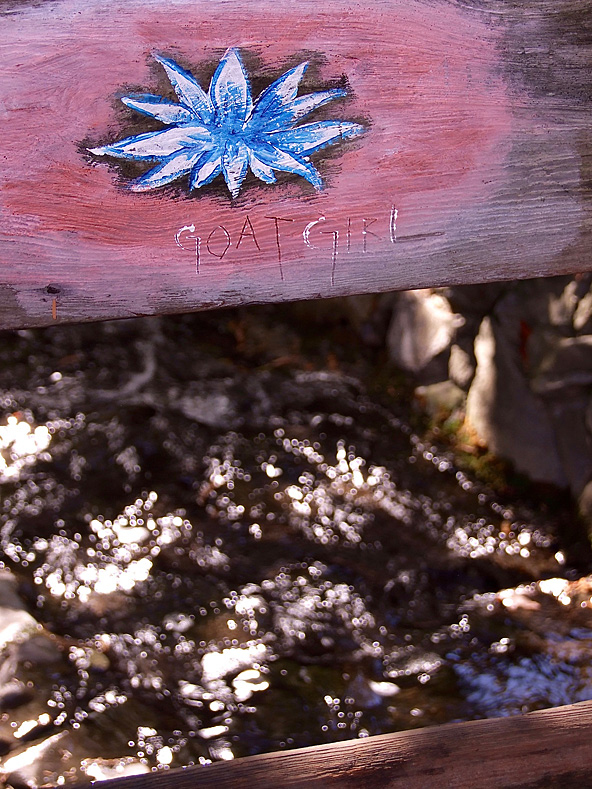 At first, I was pleasantly surprised that someone had painted a lotus on the bridge, but then I noticed the words “goat girl” carved below the paint. Which came first? The painting or the carving? Based on the wear pattern, I would guess that the painting was first, but I’m curious to hear your thoughts in the comments, of course. I crossed the bridge, finding a wooden bench near the steam on the other side. I sat down and it occurred to me that this would be an excellent place to meditate. I closed my eyes and continually brought my attention back to the feeling of air on my nose, back to the present moment. Thoughts kept coming up, and I noticed my brain doing a good bit of cleaning house as I continually brought my attention back to the touch of crisp air on my nostrils. I hadn’t planned to meditate here at all, and when I opened my eyes again, I was shocked to find that 45 minutes had passed! I felt incredibly relaxed and more centered than before, and as I hiked back around and up to the entrance, I thought about some teachers I’d known who had told me that every step itself could be a meditation. After avoiding some mud and realizing I had taken the long way around the nearby tennis court, I saw the Golden Gate bridge above the horizon in the far distance and snapped the photo below. Even though most of the garden was dead, I was still surrounded by so much beauty, and I felt warm gratitude in my heart for where I was. Recommended. 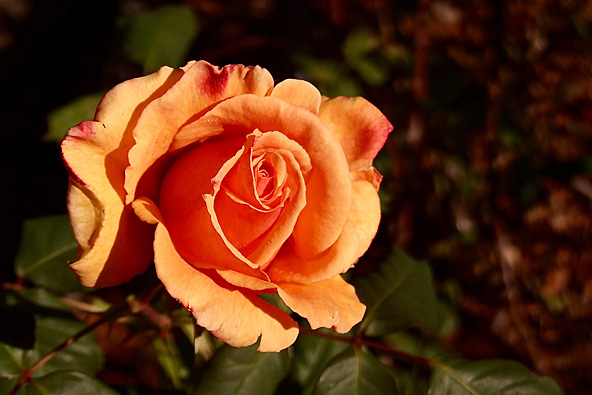 More photos from this trip are in the Berkeley Rose Garden album. The following article was written by Marco the Spacefarer, a small spaceman who sometimes follows me on my adventures. I hope you enjoy his… unique perspective. Marco here. After reviewing Andrew’s photos carefully, I’ve come to the conclusion that my initial opinion of the museum may have been premature. I’d also forgotten just how much crap they’d managed to shove into that space. 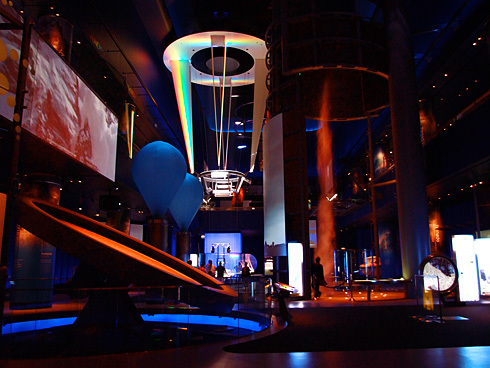 And today, I’m excited to have the honor of pointing out the flaws and sheer atavism in six attractions within the Science Storms exhibit, complete with snarky remarks beneath each photo. Yet somehow that room felt spacious. Primitive, yet spacious, so let’s begin. We’re going to have some fun together. 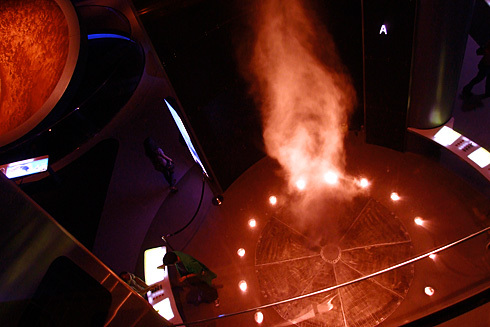 A sign beside this amusing machine explained that a tornado is a massive air vortex. Oh, really? Because I thought it was made up of wind faeries and strawberry daiquiris. Please. The sheer level of ignorance that precludes such a sign boggles my mind. I knew earthlings were ignorant, but this is child’s play, my friends. Anyway, I have to admit that it was fun to watch, even if the vortex fan controls had the response time of a Rube Goldberg machine. Now this one, while simplistic on the surface, actually had a fair bit going on underneath. Literally. As any spacefarer knows, three forces are at work during an avalanche: friction, gravity, and particle collisions. And a nearby sign even explained these forces, including the additional centripetal force of the spinning disc, as well. There was even a camera controlled by a touchscreen beside the sign. Even after Andrew had left, I stood there for some time, admiring the rusty grains creating ever-changing patterns on the disc below. It reminded me of my own world. Speaking of patterns, here’s a device that would have truly been an embarrassment were it not for one simple fact: the watery patterns projected onto the floor below were quite beautiful. 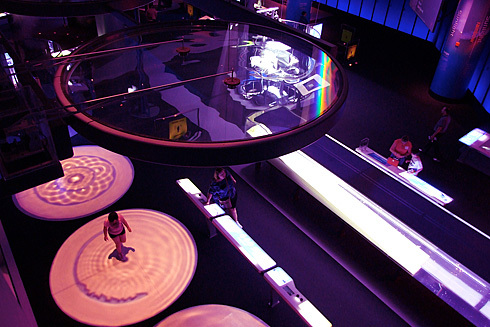 In the photo above, you can even see a girl playing in the center of one. If you’re not familiar with these (and being an Earthling, I wouldn’t be surprised), these patterns are produced by two or more waves colliding, creating a difference pattern. In this case, the effect is produced by projecting light through a shallow pool of water. Out of everything I saw in the exhibit that day, this was the only point of interest that really entertained me for a considerable period of time. After Andrew played with it for a good 20 minutes, I walked up, still carefully camouflaged, and tried to deduce the workings of this primitive physical computer. What I found was surprisingly enjoyable. On the surface of a long table were small black discs. When placed over a projected image of the periodic table of elements, the disc would “become” any atom that you placed it over. 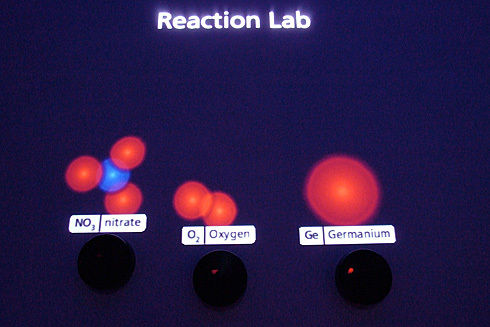 And when you combined different discs, different molecules would result, often prompting the machine to show a short video of that element in action. After a short time, I had produced Potassium Carbonate, but was sadly unable to extract the material from the machine. Clearly, it was in some state of disrepair. 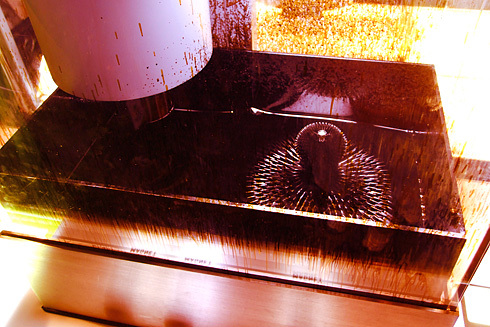 Lastly, I stumbled across a truly intriguing material: ferromagnetic fluid. If you’re not already familiar, this is a fluid that responds to magnetic fields, which causes the unique shape you see above. Those pointy ends are actually where the magnetic field waves are the strongest, and I had endless fun adjusting the strength of the magnet and modulating the porcupine-like shape (if endless fun is roughly two minutes, that is). 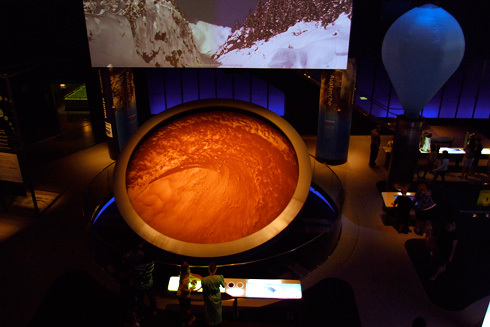 Anyway, that concludes this brief tour of the Science Storms exhibit. If you are coming to this museum, you would indeed have a solid argument for punching yourself in the face if you missed this exhibit. 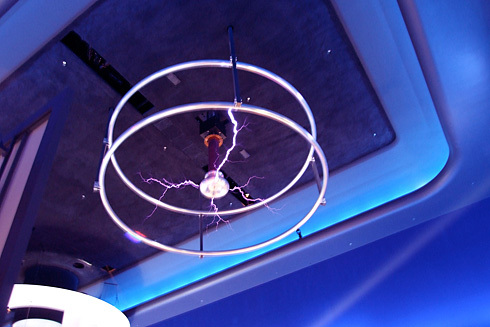 Man up and buy/rent/steal a bigger Tesla Coil, put it in a room, and create lightning that actually scares people. You humans are too unaware of your own mortality, not to mention the beauty of an electric storm. Experiencing both up close would help you cultivate a healthy respect for the true power of electrons and do you all a world of good. Also, record it and share the videos. That is all.